Is the “grass always greener on the other side of the fence?” Thinking that’s true leads a lot of us to travel hundreds of miles and cross oceans and borders to get our fix of boating and other outdoor activities. Sometimes we overlook the fun we can have closer to home. Maybe the waters aren’t as challenging or exotic as those distant ones, but they have their own charm and beauty. A stalwart paddle crew on a local Idaho river. Another way to rediscover closer-to-home fun is to change craft. If you’ve been whitewater kayaking, switch to a touring kayak or raft. If you’ve been rafting, get into an inflatable kayak. 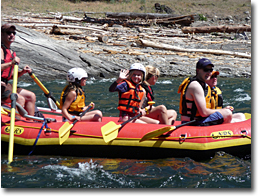 Editor’s Note: I’ve been rafting for a long time. In the past couple of years, I’ve been doing some touring kayaking. It’s taken me to places near where I live that I’ve never been before and opened up a new world of getaways. And check out our book selection. There are a number of books on boating trips in individual states and in regions of the US. Something else that can put a new twist on the outdoor experience is a trip with an outfitter. You can find many different types of trips, for every budget – from half day to multiday rafting, sea kayaking, canoeing and fishing. Some are high adventure; others are for the whole family. Some outfitters offer specialty trips: wildlife watching, geology, women-only… even wine tasting! And let’s face it, our outdoor adventures don’t always have to involve boating! Going hiking, backpacking and car camping are great ways to spend time with family and friends who don’t boat. There are thousands of campsites across the country, on private and public lands. We’re so fortunate to have our system of national and state parks, monuments and forests, where camping and other recreational activities abound. Much of the gear that you use for boating, like the cooking equipment, chairs and tables and toilet systems crosses over to your car camping and backpacking. So you’re not out extra money to cross over to another outdoor activity. 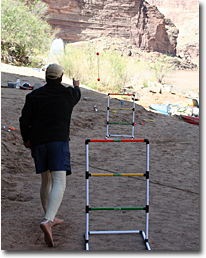 And a game like BlongoBall is just as much fun in a campground as it is on a river beach! AdventureVacation.com – a site provided by America Outdoors, a trade association of national and international outfitters. You can find trips on both water and land here. Also, most states have their own outfitter associations. Do a web search with the name of the state and either “outfitters association” or “guides association”. Idaho Outfitters and Guides Association – in addition to whitewater outfitters, here you’ll also find hunting, fishing, hiking, biking, climbing, backcountry skiing and guest ranches. Middle Fork Outfitters Association – an association of companies who do trips on Idaho’s famous Middle Fork of the Salmon River. They also supply info and links for boaters who are doing private Middle Fork trips. Recreation.Gov – lets you search federal public lands for all types of recreational activities. You can plan your trip, find information on camping, day use, tours and wilderness permits. You can also reserve campsites. Reserve America – a company that not only makes reservations for federal and state campgrounds, but also many private ones. Whatever form it takes, outdoor recreation beats hands down sitting on the couch in front of the one-eyed-god. Get out as often as you can: feel the sun, breathe the air, listen to the sounds, savor the experience. Wishing you a great outdoor season!